The outer layer of your teeth, called enamel, is a semi-translucent layer of highly resilient mineral crystals that covers and protects the main structures, or dentin, of your teeth. The color of your teeth is dictated by the shade of your underlying dentin, yet stains and discoloration on your tooth enamel can have a dramatic effect on your smile. Surface stains, also known as extrinsic stains, can occur even when you diligently clean and care for your teeth. Fortunately, professional teeth whitening can quickly and conveniently erase extrinsic teeth stains so you can return to your daily routine with a brighter, more attractive, and healthier-looking smile in no time! 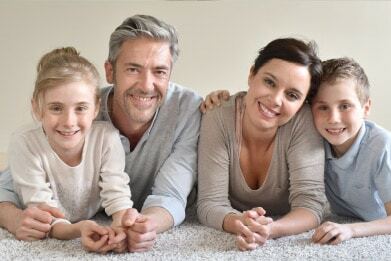 At Coppertop Family Dentistry, we offer a safe but potent take-home kit that contains a custom-designed set of trays and a supply of professional-strength bleaching gel. If you notice that your smile is losing its youthful glow and that your teeth are becoming darker and less vibrant, then it may be time to consider professional teeth whitening. During your routine checkup and cleaning, Dr. Olson will carefully examine your teeth and dental health to ensure that bleaching is the right option. Then, he will custom-design your trays and provide you with enough whitening gel to last for 10-14 days. By applying the gel for an hour or two each day, you can dramatically brighten your smile by several shades from the comfort of your own home. If your teeth stains are not extrinsic, but originate from within the dentin, then teeth whitening may not be the optimal solution. Instead, Dr. Olson will diagnose the cause behind your tooth discoloration and recommend an appropriate cosmetic or restorative treatment to address the underlying problem.